Luis Masriera Roses (1872-1958) - was a versatile artist: painter, playwright, set designer and goldsmith. He was the son of Josep Masriera i Manovens and nephew of Francesc Masriera i Manovens and continued the family tradition as a painter and goldsmith. He studied in Paris, London and Geneva (1889), where he learned the art of Limoges from Frank Édouard Lossier. He reintroduced the translucent and opaque enamel in Catalonia, with an exhibition in Barcelona in 1901 where he presented his already personal style based on Art Nouveau influences of René Lalique. He exhibited in Barcelona, Zaragoza, Madrid, Paris (Salon des Artistes Français), Buenos Aires and San Francisco, both as a goldsmith and painter. In 1925 he presented in Paris eleven pieces of Art Deco jewellery at the Exhibition of Modern Decorative and Industrial Arts, where the name Art Deco originated. At the same time Luís Masriera was interested in the heritage, as Academician of the Royal Academy of Sciences and Arts of Barcelona, and as the president of the Catalan Royal Academy of Fine Arts of San Jorge (between 1944 and 1952) and as a member of the Museums Board (1918-1934), became one of the major cultural managers of a long and difficult period. Collector and owner of an interesting collection of oriental art, paintings and sculpture, his study room became a public museum in 1913. His paintings, starting with realism, turned towards modernism, including all the iconography of the period: fairies, angels, witches and butterflies, with decadent contents made with gentle tones and boisterous songs with a live and decorative colorismo. 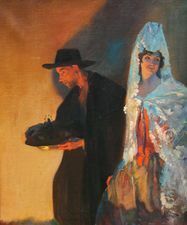 Notable among his oil paintings is La sombrilla japonesa (1920), of which he made several replicas. In his later stage, into the 1920s, Luís Masriera became increasingly devoted to the theater, another of his passions, as a playwright and stage designer. His works are in museums and international collections (especially his jewellery designs, but also his paintings, increasingly valued).